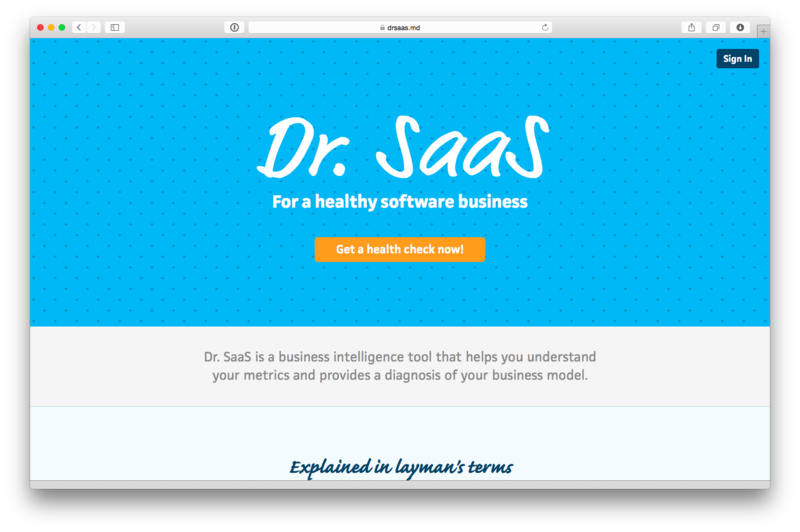 I want to walk through an example of getting a diagnosis for Dr SaaS, to show how easily you can do this for your SaaS business, and what sort of analysis you can expect to get out of it. 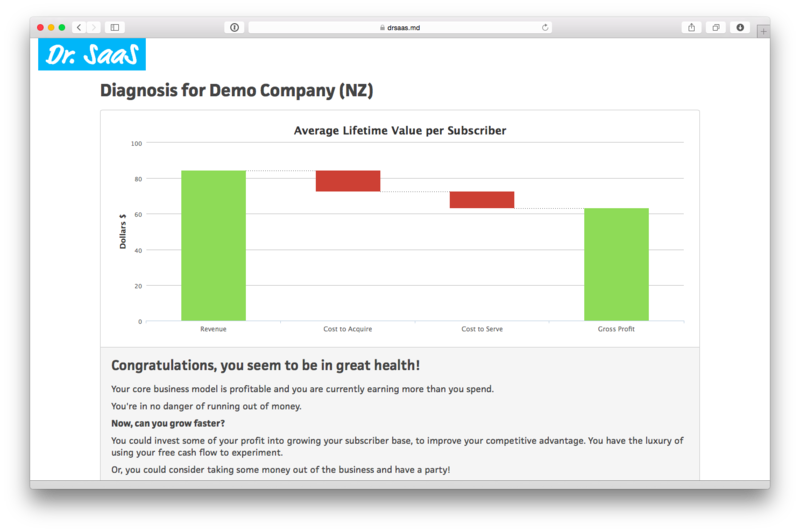 To get some numbers to use for this, I’m using the Demo Company which is available in Xero (if you’d like to play along at home, log into Xero and look at the bottom of your My Xero page for a link to your own copy of the Demo Company). 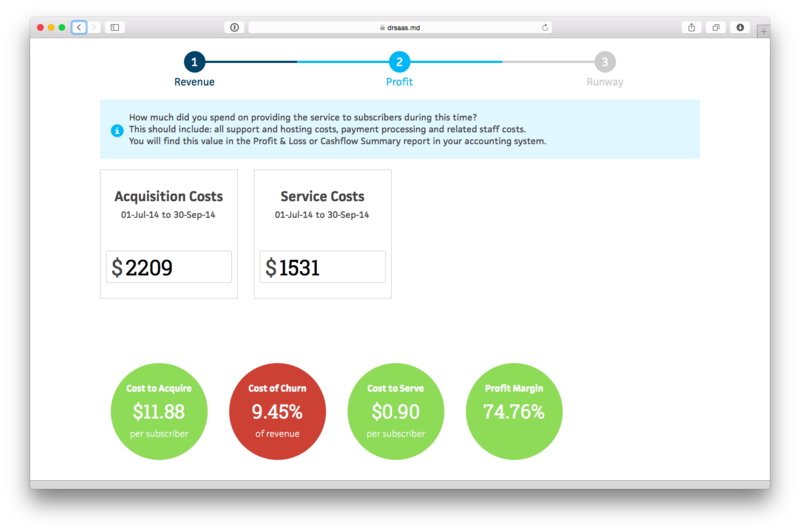 For the purposes of this demo I’ve changed two of the accounts to better match the sort of expenses you might have in a small SaaS business: “Subscriptions” is now “Staff Costs” and “Rent” is now “Hosting”, otherwise the data is straight out of the box. 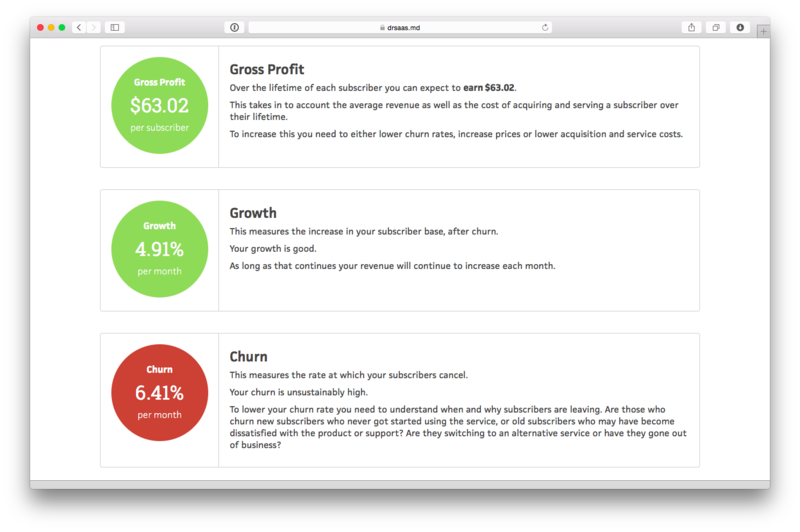 This step collects details about subscribers and revenue, and calculates growth, churn and average revenue values. We will need to make up the subscriber numbers, as there are no details about this in Xero. 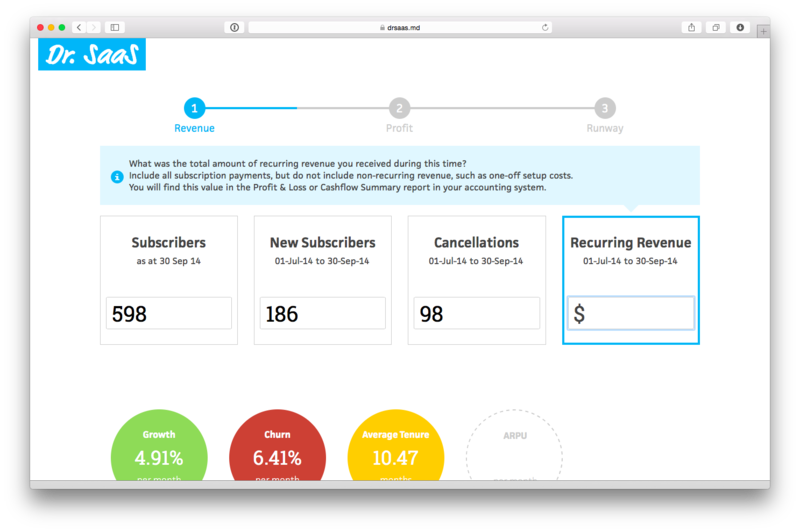 When you’re doing this yourself, you can get your subscriber numbers from your customer database or billing system. Firstly, enter the number of subscribers you have at the end of the period. This should include both free and paid subscribers, if you have both. We will say 598 subscribers at 30 Sept.
Secondly, enter the number of new subscriber you acquired during the period. This should count every new subscriber who joined during this time, even if they have already cancelled. We will say 186 new subscribers between 1 July and 30 Sept.
Thirdly, enter the number of cancellations during the period. We will say 98 cancellations between 1 July and 30 Sept. The revenue number is shown at the top. 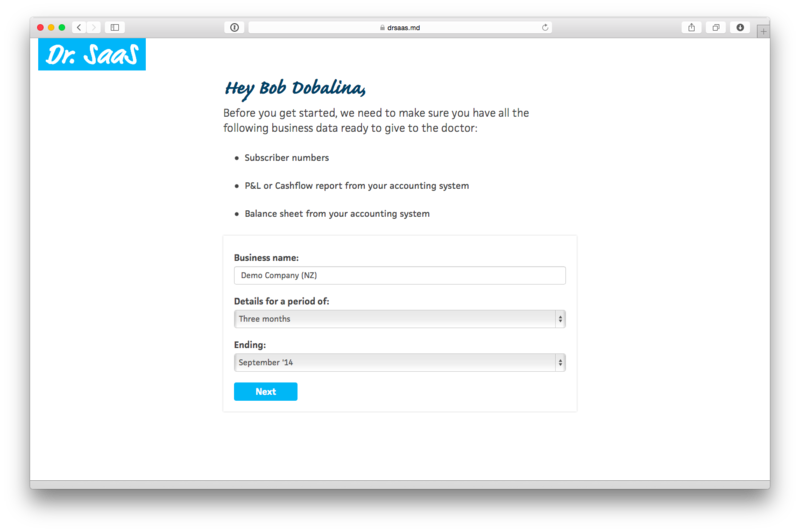 If you have other revenue you should only count recurring revenue from subscribers at this stage (other revenue will be entered separately in Step 3 below). In our example, there are sales of $13,733 showing in the P&L, so we enter that value here. Already we have some useful information – the growth rate is 4.91% per month, which is okay, but churn is 6.41% which is very high and means that on average each new subscriber only sticks around for just under 10.5 months, on average we earn $8.05 per subscriber per month, which doesn’t leave a lot to play with. This step collects details about how much we spend acquiring and servicing subscribers, and calculates our cost of acquisition, cost to serve and also profit margin. Acquisition costs – i.e. all sales and marketing costs, commissions, discounts and related staff costs. Service costs – i.e. all support and hosting costs, payment processing and related staff costs. You can see from the bubbles at the bottom that we’re currently spending $11.88 to acquire each new customer and 90c per month to service them, which leaves a profit margin of 74%, which isn’t bad. But, again, the problematic value which is highlighted is the cost of churn, which is the effective amount spent each month to overcome churn – i.e. we currently spend 9.45% of all of the revenue we earn each month to acquire new subscribers to replace those subscribers who churned. This final step collects the remaining details about expenses, and also how much cash is available to cover these expenses, to calculate a burn rate, breakeven target and cash runway. From this we can see that the calculated breakeven target is 118. This shows how many subscribers are required in order to cover all of the operating costs and other costs, given the current business model. In our example, this is good news as we already have more subscribers than this. However, we have not yet considered the other costs which are not included in the P&L, such as capital expenses, capital raising costs, and tax as well as foreign exchange movements. 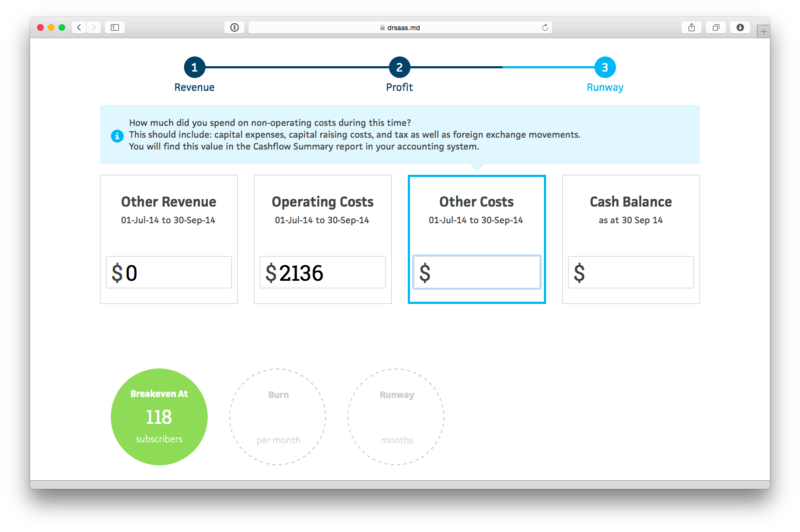 To get these we will need to look at the Cash Summary report in Xero, which shows that during the period we spend $1652 on computer equipment, so we enter that here. Finally, we need to look at the cash on hand in the Balance Sheet report in Xero. At this point we get the calculated burn rate and runway. In our example the burn is negative, so the runway is effectively infinite, but assuming you’re not yet making a profit these values will show how much cash you burn each month and how many months you have left assuming current burn rates. This graph can be a bit confusing at first, but is actually simple. It shows the lifetime value per subscriber. 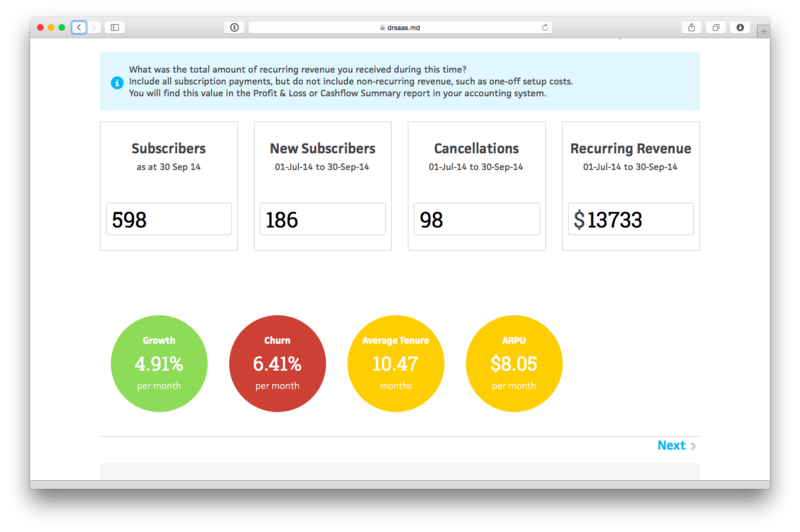 The green revenue bar, on the left, shows the total amount of revenue you can expect to earn from a new subscriber on average. In our example, this is $84.29. The value is based on the average tenure of a new subscriber (derived from churn rates) and the average revenue per subscriber. The two red bars in the middle show the cost to acquire and cost to serve, again over the lifetime of the subscriber. In our example these are $11.88 and $9.40 respectively. The bar on the right shows the remaining gross profit – i.e. revenue less costs. If you have a profitable business model then this bar will be green, as in the example above. Otherwise this will be red, meaning you are effectively losing money on every new subscriber! The second part of the diagnosis highlights specific metrics which are relevant to your situation. In our example, it shows the gross profit value of $63.02 and growth rate of 4.91%, which are both positive, and also highlights the high churn rate of 6.41%. Again, the metrics that are displayed are different for each company, depending on the values that have been entered and the things you should be focussing on. 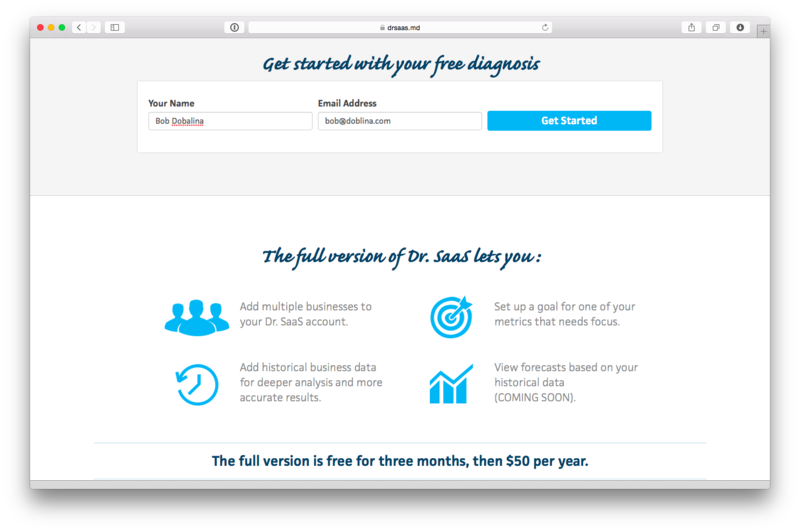 From this page you can choose to save the diagnosis, which allows you to share details with others on your team, enter multiple months to keep track of the full history, and setup a goal for one of your metrics that needs focus. You can also enter values for multiple businesses and switch between them easily – great for people like me who spread their time across multiple companies. Why not put the sign-up at the end? That’s a roadblock for me, not that I’m the easiest of users. It’s free to use the tool as I’ve described above. You just need to provide an email address and company name. Enter garbage, if you’re paranoid. The sign-up for the full account is at the end. You could also argue that a compounding growth rate calculation is more appropriate. The 4.91% growth rate implies to me an instantaneous growth rate based on a constant net monthly growth rate of 29.33′ customers, the constant net growth rate is unlikely to an appropriate assumption for a growing SaaS business. From a reporting perspective I think the growth rate should be calculated based on the opening customer base. The more important consideration is how the growth rate is defined and applied for the projections used to calculate the burn-rate and runway.